The Kingmakers is in the middle of a blog tour! I'm not participating in this tour, but I think you should check out every stop on this tour! There are some great prizes. To even the odds, Adele unleashes the power of her geomancy, a fear- some weapon capable of slaughtering vampires in vast numbers. However, the power she expends threatens her own life even as she questions the morality of such a weapon. As the war turns ever bloodier and Adele is threatened by betrayal, Gareth faces a terrible choice. 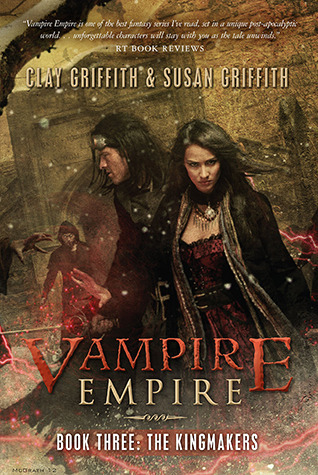 Their only hope is a desperate strike against the lord of the vampire clans—Gareth's brother, Cesare. It is a gamble that could win the war or signal the final days of the Greyfriar. Horror of horrors! The Vampire Empire series is over! At least it ends with a bang. The Kingmakers is a fabulous conclusion to one of my favorite series. The book begins with Europe in full scale vampire war. And it's not going well for the humans. The vampires are thwarting all their plans. Almost as if they know their moves before they make them. Perhaps there are spies in Equatoria's mist. Adele and Greyfriar are the humans' best hope for victory. But they are only two people. The battles and politics are as complicated as ever in this final novel. They are described with a bit too much detail at times, making the book drag, especially at the beginning. But then again that attention to detail is one of the things that sets this series apart from others. Adele and Greyfriar are as good as ever. I love Adele's bravery and skill in the battlefield. She is similarly intelligent in politics and strategy and shows compassion for her people. Greyfriar is one of my all time favorite characters. His subtle, dry wit is hilarious. Even Anhalt can't help like him. He is a man of action - he attacks first and thinks later. Unfortunately, he is increasingly worried about his role as Greyfriar, savior of the people. As great as it is to swoop in and kill tons of vampires, his role is very limited. He saves a few while thousands of others perish. Is there a point to still being Greyfriar? An interesting theme of this series is compassion for creatures who are not like you. Adele and Anhalt have realized that vampires aren't all the mindless, evil creatures they once thought them to be. Similarly, Greyfriar realizes that not all vampires have misused their powers and are not all deserving of death. The war is going to result in the mass slaughter of innocent vampires as well as humans? Right and wrong is no longer black and white. It's amazing how creatures who seem entirely alien quickly seem "human" when you get to know them. Adele and Greyfriar's romance continues to be touching and satisfying. Nothing can match the simple sweetness of the first book but I still love reading about them together. They are a pair of equals. Adele trusts Greyfriar to act on his own but also feels the need to keep him from danger. Greyfriar is extremely protective of Adele and very chivalrous but always respects her abilities and independence. Even if her actions are dangerous he knows she can take care of herself. The Kingmakers hits all the right notes for a concluding novel. The beginning is a little slow but we get into the story and characters quickly enough. Soon we're carried away by very complex drama - politics, battles, assassination attempts (plural), subtle humor, geomancy (still confuses me), and romance. The story shifts between France, Alexandria, London, and Edinburgh (Morgana and Baudoin are back!). I am so sad to leave Adele and Greyfriar. I'd love to read more about their story. Maybe a spin-off featuring Greyfriar in his earlier days. Please write more! Until then, everyone should read this series. Oh, yeah! I almost forgot about this book. I read the first two, but really only liked the first one. I had to slog through Book 2. It may have killed my interest in the series, but I'm willing to consider reading Book 3. I loved the first book. The second disappointed me a bit but I'm still dying to know how the Griffith's wrap up everything they've laid out over the past two books. It almost seems impossible but it sounds like they succeeded. I found you blog through Cathy Keaton's site. I really liked the first book in the Greyfriar series. Glad to know it ended well. Now I just need to get the other two books and read them! Nice review! I haven't heard of this series but I'm glad it ended so well! It's always disappointing when series falter but hooray for this not being the case. It sounds like such an intricate story, especially with the point you brought up about compassion. Great review! Okay, haven't read this last one but I've really enjoyed this series! I don't know why I was surprised (maybe because I"m drawn to pretty covers and this one is just...not so much. But it's dark and gritty and really does match the story inside so I 'm not complaining.). Good to hear that it ended well but sad that it ended!